CANDELARIA DE LA FRONTERA, El Salvador, Jan 2 2019 (IPS) - As he milks his cow, Salvadoran Gilberto Gomez laments that poor harvests, due to excessive rain or drought, practically forced his three children to leave the country and undertake the risky journey, as undocumented migrants, to the United States. Gómez, 67, lives in La Colmena, in the municipality of Candelaria de la Frontera, in the western Salvadoran department of Santa Ana. The small hamlet is located in the so-called Dry Corridor of Central America, a vast area that crosses much of the isthmus, but whose extreme weather especially affects crops in Guatemala, Honduras and El Salvador. 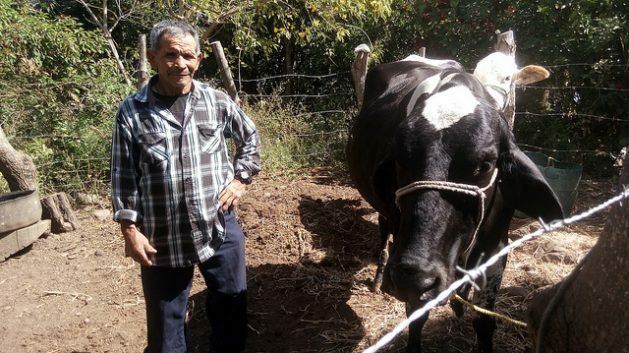 “They became disillusioned, seeing that almost every year we lost a good part of our crops, and they decided they had to leave, because they didn’t see how they could build a future here,” Gómez told IPS, as he untied the cow’s hind legs after milking. The year his children left, in 2015, Santos Giovanni lost two-thirds of the crop to an unusually extreme drought. “It’s impossible to go on like this,” lamented Gómez, who says that of the 15 families in La Colmena, many have shrunk due to migration because of problems similar to those of his son. The Dry Corridor, particularly in these three nations, has experienced the most severe droughts of the last 10 years, leaving more than 3.5 million people in need of humanitarian assistance, a report by the United Nations Food and Agriculture Organisation (FAO) warned as early as 2016. Now Gómez’s daughter, Ana Elsa, 28, and his two sons, Santos Giovanni, 31, and Luis Armando, 17, all live in Los Angeles, California. “Sometimes they call us, and tell us they’re okay, that they have jobs,” he said. 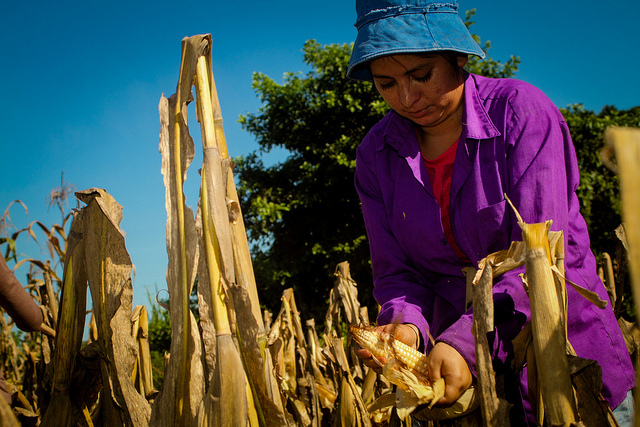 The case of the Gómez family illustrates the phenomenon of migration and its link with climate change and its impact on harvests, and thus on food insecurity among Central American peasant families. La Colmena, which lacks piped water and electricity, benefited a few years ago from a project to harvest rainwater, which villagers filter to drink, as well as reservoirs to water livestock. However, their crops are still vulnerable to the onslaught of heavy rains and increasingly unpredictable and intense droughts. In addition to the violence and poverty, climate change is the third cause of the exodus of Central Americans, especially from Guatemala, Honduras and El Salvador, according to the new Atlas of Migration in Northern Central America. The report, released Dec. 12 by the Economic Commission for Latin America and the Caribbean (ECLAC) and FAO, underscores that the majority of migrants from these three countries come from rural areas. Between 2000 and 2012, the report says, there was an increase of nearly 59 percent in the number of people migrating from these three countries, which make up the so-called Northern Triangle of Central America. In Guatemala, 77 percent of the people living in rural areas are poor, and in Honduras the proportion is 82 percent. In recent months, waves of citizens from Honduras and El Salvador have embarked on the long journey on foot to the United States, with the idea that it would be safer if they travelled in large groups. Travelling as an undocumented migrant to the United States carries a series of risks: they can fall prey to criminal gangs, especially when crossing Mexico, or dieon the long treks through the desert. Another report published by FAO in December, Mesoamerica in Transit, states that of the nearly 30 million international migrants from Latin America, some four million come from the Northern Triangle and another 11 million from Mexico. The study adds that among the main factors driving migration in El Salvador are poverty in the departments of Ahuachapán, Cabañas, San Vicente and Sonsonate; environmental vulnerability in Chalatenango, Cuscatlán, La Libertad and San Salvador; and soaring violence in La Paz, Morazán and San Salvador. And according to the report, Honduran migration is strongly linked to the lack of opportunities, and to high levels of poverty and violence in the northwest of the country and to environmental vulnerability in the center-south. With respect to Guatemala, the report indicates that although in this country migration patterns are not so strongly linked to specific characteristics of different territories, migration is higher in municipalities where the percentage of the population without secondary education is larger. In Mexico, migration is linked to poverty in the south and violence in the west, northwest and northeast, while environmental vulnerability problems seem to be cross-cutting. “The report shows a compelling and comprehensive view of the phenomenon: the decision to migrate is the individual’s, but it is conditioned by their surroundings,” Luiz Carlos Beduschi, FAO Rural Development Officer, told IPS from Santiago, Chile, the U.N. organisation’s regional headquarters. He added that understanding what is happening in the field is fundamental to understanding migratory dynamics as a whole. The study, published Dec. 18, makes a “multicausal analysis; the decision to stay or migrate is conditioned by a set of factors, including climate, especially in the Dry Corridor of Central America,” Beduschi said. It is a question, he said, “of guaranteeing that they have the necessary conditions to freely decide whether to stay at home or to migrate elsewhere,” and keeping rural areas from expelling the local population as a result of poverty, violence, climate change and lack of opportunities. In the case of El Salvador, while there is government awareness of the impacts of climate change on crops and the risk it poses to food security, little has been done to promote public policies to confront the phenomenon, activist Luis González told IPS. “There are national plans and strategies to confront climate change, to address the water issue, among other questions, but the problem is implementation: it looks nice on paper, but little is done, and much of this is due to lack of resources,” added González, a member of the Roundtable for Food Sovereignty, a conglomerate of social organisations fighting for this objective. Meanwhile, in La Colmena, Gómez has given his wife, Teodora, the fresh milk they will use to make cheese. They are happy that they have the cow, bought with the money their daughter sent from Los Angeles, and they are hopeful that the weather won’t spoil the coming harvest. “With this cheese we earn enough for a small meal,” he said.